The Rockville RPG15BT powered PA speaker is simply amazing in terms of sound quality, raw power, and features! This model offers the same great sound as our original RPG15 but this new version also offers bluetooth integration, USB input, SD card input, graphic EQ, Effects, and a wireless remote control. This speaker has an incredible 1,000 watts of peak power and will deliver a massive amount of bass, mids, and highs. The ultra-efficient design is amazing! This RPG15BT speaker is the result of a year of research and development. We tested samples of 5 top selling powered speakers and the RPG series out-performed them all. These go louder and have punchier bass. What we found to be interesting was that some of the other speakers we tested against these were rated by their manufacturers at 1,500 watts or more, but they only went around half as loud as these. Built-in wheels and retractable top handle for increased portability and transport convenience. 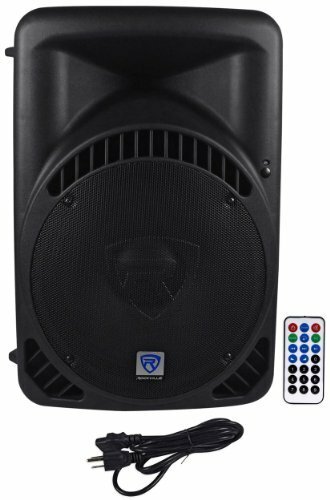 Dimensions : 18.53" X 16.59" X 27.52"
Rockville RPG15BT 15" 1000 Watt Active DJ/PA Speaker With Built In Bluetooth. 1000 Watts Peak/500 Watts Program/250 Watts RMS. High power long-throw 15'' woofer with 3" aluminum voice coil provides incredibly deep bass and acoustic power. Frequency Response: 35Hz-20KHz. Maximum SPL @1w/1m: 128dB peak / 125dB continuous. Bluetooth signal input. Now you can input any audio signal from your Bluetooth enabled music player or phone. No cables necessary! USB/SD digital MP3 music player. Input audio signals, special effects, any preprogrammed audio file and amplify it through your system. Digital MP3 recorder. Now you can actually record back to your USB or SD memory card all audio that passes through your Power-Gig system. Do a show and record it live!. Wireless remote control. Enjoy the added convenience of being able to adjust any of the MP3 player functions, including volume, from the included wireless remote. Digital Effects signal processor for "Delay / Echo" effect. Now you can time align your digital echo effect and control the echo delay, repeat interval and level. No external signal processing unit necessary, the digital effect is built in with lots of control capabilities. LCD screen displays MP3 functions including BT connectivity. High-power 2-way pro sound reinforcement speaker system for live sound and playback applications. Compact and light weight system delivers distortion free sound even at extreme SPL. Linear Class AB amplifier technology: high power, transparent sonic performance. Internal switch-mode power supply for low distortion audio with superior transient response. 5-Band Graphic Equalizer allows you to custom tailor your sound to your venue by boosting and cutting specific frequencies to improve sound quality and clarity. State-of-the-art 1.75'' Japanese made pure titanium-diaphragm compression driver for crystal clear high-frequency reproduction. Ultra-wide dispersion, 40° large-format horizontal wave guide horn molded directly into cabinet. Ultra-low noise separate Mic and Line inputs via combo XLR & 1/4" ports with independent level and effect controls. Both combo jacks accept balanced and unbalanced 1/4" signals. Line RCA and XLR input with separate Volume adjustment.